When we look at beautifully camouflaged insects, such as certain butterfly species which look so much like the leaves or vegetation of their environment, we sometimes forget that they are not camouflaged for our eyes, but for those of their would be predators, which might have better eyes than us (like a hawk or owl). Also, as creatures of flight – when they are perhaps the most exposed – they need camouflage to act in a different way from that when they are resting against a static background. Photography is a good way of revealing such adaptations. 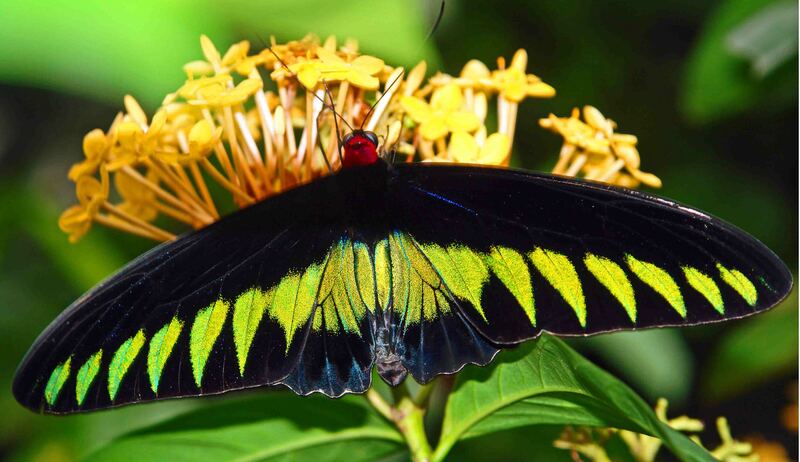 Rajah Brooke’s Birdwing (Trogonoptera brookiana) is one of the most attractive and distinctive butterflies found in South-East Asia. Each fore-wing has seven leaf-like bright green markings on the trailing edges, which are much brighter green on the males. The colouration of the females – which are reportedly secretive and elusive in nature – is much browner and duller. 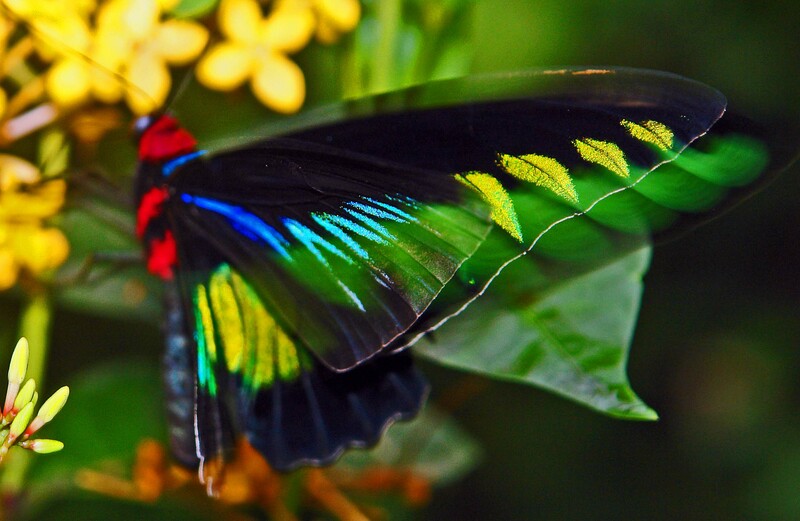 So, as the males are much more active, maybe they need the more vivid colouration to camouflage them as they fly. This idea occurred to me as I was reviewing photographs of the butterfly which I took in the excellent Kuala Lumpur Butterfly Park. It was only when I looked at the slightly blurred images – indicative of movement (well that’s my excuse for an out-of-focus image!) that I realised how clearly the wing marking resembled leaves – and perhaps the colourful shimmering butterflies confused predators with this array of vivid, leaflet-like patterns? Furthermore, I speculated, perhaps the colours and patterns of this insect only achieve their maximum effect (I am tempted to say purpose!) when the insect is in flight? In other words when the butterfly is moving in the vision of its would-be predator? Well it’s a thought! The world was not made just for our eyes. Ray Cannon's nature notes Camouflage – in whose eyes?